Make a choice and commit to a new way of life. The Gang Intervention Team is responsible for providing gang intervention support across British Columbia. 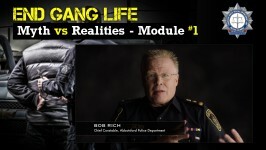 We work with high risk individuals who are either engaged or at-risk of engaging in gang activities. The team conducts outreach and intervenes with those involved in the gang lifestyle and has the capacity to use enforcement tactics to disrupt their criminal behaviour. Various intervention tools are implemented to discourage individuals from further engaging in such activities and to encourage gang exit. The Gang Intervention Team also works hand-in-glove with other police agencies on targeted enforcement strategies in hot spots where gang violence persists. The team has the capacity to conduct assessments, provide emergency gang intervention and use focused deterrence tactics with individuals who pose the highest risk to public safety. This is the first of its kind in British Columbia and is modelled after similar initiatives elsewhere in Canada and the United States. The Gang Exiting and Outreach Program that will use an integrated case management approach to provide exiting supports to adult gang members 18 years and older, while also providing outreach and supports to the gang members’ family, friends, and communities to support gang education, prevention, and exiting success in the Metro Vancouver region. Ongoing and practical supports to help the person exiting address longer-term concerns related to housing, banking, criminal justice system involvement, etc. The Pilot is being steered by key justice and public safety sector partners that have a direct mandate to address community safety and gang-related violence in the Lower Mainland. These include the Community Safety and Crime Prevention Branch and Policing and Security Branch of the Ministry of Public Safety and Solicitor General, the Combined Forces Special Enforcement Unit of British Columbia, the Royal Canadian Mounted Police, the City of Surrey, and the Surrey School District. Policing is a partnership between the community and those who serve. We are very fortunate to have many interested and active community partners who wish to work with police as we work to make British Columbia Canada’s safest province. We actively support and work directly with a number of community organizations to address the many underlining issues which are at the heart of many gang-related crime issues which exist today.